Indigo Lake in Fishers is a small neighborhood of charming cottage style homes located off Cumberland Road north of 131st Street. Indigo Lake is made up of both ranch and 2-story homes built in the late 1990s. 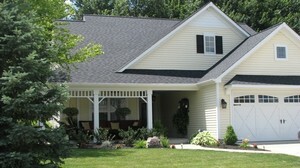 Architectural features include wrap around front porches and dormer windows. Indigo Lake homes average 1500 square feet and do not include basements. Below you'll find the newest Indigo Lake homes for sale. This information is updated daily by our Indianapolis listing service. To see more Indigo Lake homes, or any other real estate for sale in Fishers and the surrounding areas, fill out the property search form above. When you sign up for this free information, you'll begin receiving e-mail alerts as soon as new homes that meet your criteria come on the market. You'll also be alerted to price changes for any homes you've already viewed. Learn more about living in Fishers Indiana, a CNN Money Best Places To Live in America!